As many investors know, a stock market trend is very unpredictable. The stock market is constantly fluctuating, swinging back and forth, leaving investors and advisors with either market gains or market losses. With an ever-changing market, it is up to investors to take advantage of a trend. A successful advisor or investor will know how to play and ride with the market trend. When it comes to market trends, there are two major types: the bear market and the bull market. 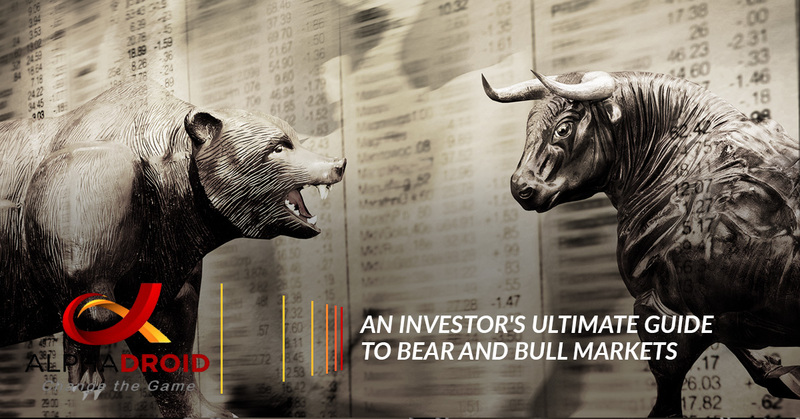 Both bear and bull markets are terms that are used to describe a long-term trend in the stock market. As an investor, knowing the difference between the two and understanding their characteristic is essential to following market trends. A bear market is defined as a financial market which is characterized by a consistent fall in the prices of securities, or a fall in the stock market as a whole. While certain sectors may experience a bear market, that does not necessarily mean that other sectors of the market will be going through the same thing. In fact, other sectors are either remaining stationary or are in decline. Compared to a bull market, it can be more challenging to make money in a bear market. By selling call options against currently owned stock, investors can protect their profits or generate current income. This strategy is known as writing a covered call and it involves selling the right to purchase currently owned stocks at a set price for a set period of time in exchange for a premium. If the underlying stock does not increase in value to the set price, the option will likely expire unexercised. When this happens, the original investor gets to keep both the stock and the premium. A bear market occurs when the major stock indexes continue to lower over time; they will reach new lows. On the other side, their highs will also be lower than before, too. Usually, the average length of a bear market is around 367 days. Between 1900 and 2008, with an average duration of 367 days, a bear market took place 32 times. For this, it can be estimated that a bear market will happen once every three years. Often times, bear markets are accompanied by recessions, hence why we saw a recession in 2008-2009. When a recession occurs, the economy stops growing instead begins to contract. When the economy contracts, we are left with layoffs and skyrocketed unemployment rates. Investors can recognize a bear market if they know where the economy currently is in the business cycle. Economies just entering the expansion stage are unlikely to face a bear market. In a bear market, where the supply is high and the demand is low, there are lower stock prices. In this market, there is a risk of losses due to stocks continuously losing value while the end of the trend is undetermined. In order for an investor to take advantage of a bear market, they can either experience gains by short selling, which is the selling of borrowed shares and then purchasing them back at significantly lower prices, or they can make safe investments into fixed income securities. When the stock market as a whole is decreasing in price, it is more than likely experiencing a bull market. Like bear markets, not all sectors of the economy may participate. While certain sectors of the economy may decline, there are other sectors that may be rising. When a bull market is in existence, the easiest way to make money is to buy a security, wait for the prices to rise, and then sell it for a profit. The difference between the purchase price and the sale price of the stock is widely known as a capital gain. While there is no formal qualification that defines a bull market, there are several things that accompany bull markets that help investors recognize that it is affecting certain financial sectors. Bull markets usually occur during time periods when the economy is either strong or in the process of strengthening. When this happens, there is often a strong GDP growth, a dropping unemployment rate, and rising company profits. However, one of the best non-numerical ways of recognizing a bull market is by looking at the rise in investor confidence. When a bull market is occurring, there is generally a strong demand for stocks and market commentary tends to be positive. Making profits in a bull market is far less complicated than doing so in a bear market. In a bull market, the demand for stocks are high while the supply of securities are lower since most investors are unwilling to sell their stocks. In fact, many successful advisors and investors prefer to hold on to their stocks due to their profit and interest returns being higher than normal. Out of the two types of stock markets, a bull market has a higher chance of return than a bear market. As the values of securities continue to rise, any losses are usually minor or temporary. A bull market is when there is a rise in the overall performance of the market. A bear market is when market performance experiences a huge decline. In bear markets, an investor’s outlook is usually pessimistic, while in a bull market their view of the future is more optimistic. In bear markets, the stock prices are low, while, in bull markets, stock prices are high. Bull markets tend to have strong market indicators, while bear markets have weak ones. Bull markets draw positive responses from investors, encouraging them to invest their money in order to get profitable returns. On the other hand, bear markets cause negative responses, scaring investors of investing money when there is a continuous fall. The economy grows during a bull market and declines during a bear market. In a bull market, the trading of a stock is high. Oppositely, in a bear market, stock trading is low. How to work through bear and bull market trends? For financial investors and advisors, working through market trends can be a challenge and selecting safe investments during these trends is essential. While there are various ways an investor can work through a bull market or a bear market, using premium asset allocation software helps them make more informed decisions using industry standard data. And, for elite and effective financial planning tools, investors need to turn to AlphaDroid. AlphaDroid is an algorithm investing technology that helps predict the stock market by following trends. With AlphaDorid’s True Sector Rotation® and StormGuard Market Crash protection, investing in a bull or bear market has never been easier. Using True Sector Rotation, investors practice the method of owning the one best-trending fund at any given time. Instead of attempting to predict what market sectors should be doing next month based on previous cycles, patterns, and data, AlphaDroid uses its True Sector Rotation to measure what market sectors are already doing and selects the best trend leader to own from a set up of 12 candidate funds. Using this can help investors improve their returns while reducing risk. This algorithm provides investors with the best bull market performance by using Modern Portfolio Theory, helping investors experience financial gains. AlphaDroid StormGuard algorithm is efficient at monitoring the overall health of a stock market and suggests strategies to move into safety when there is risk present. While investors can select from among six different algorithms for down market protection, AlphaDroid’s StormGuard Indicator is one of the industry’s best performing market segment indicator thus far. Using StormGuard, investors are enabled to perform a balanced optimization to concurrently reduces profit losses that come from reacting too slow flow when there is a drop in the market. In addition, StormGuard also helps minimize the losses from long-term bear markets by not reacting too slowly. Using innovative algorithmic trading strategies, AlphaDroid assists in analyzing, constructing and comparing investment portfolios. To learn how AlphaDroid can make working through market trends less of a hassle, making the overall investment process easier, contact our team today!